What’s in the Samsung Galaxy S5? Home > What’s in the Samsung Galaxy S5? Each of these phones costs Samsung US$256.52 to make. IHS Teardown’s dissection of Samsung’s latest flagship smartphone reveals a high bill of materials (BOM), due to upgraded components and a multitude of sensors crammed into the device. According to IHS Teardown, Samsung used a discrete-intensive design for the Galaxy S5 smartphone, and a unit from the South Korean market carrying 32GB of NAND flash memory costs US$251.52 in components. With a US$5 manufacturing cost added on, each of these phones costs Samsung US$256.52 to make. This is in comparison with competing high-end smartphones, such as the 32GB iPhone 5S, which has a US$207 bill of materials. According to Andrew Rassweiler, senior director of cost benchmarking services for IHS, Samsung’s flagship Galaxy phones tend to have high cost of BOM. Most of the changes relate to the components used within the device, with Samsung’s engineers opting for updated chips to deliver various functionality. Previous Galaxy products used Qualcomm’s WTR1605L radio frequency transceiver, whereas the S5 uses the WTR1625 chip instead. The NFC communication controller is also a new version, compared to the NXP PN5441, PN547 and PN65N from previous Galaxy devices. The S5 also uses the Audience Semiconductor ES704 noise suppression devices, rather than the eS305B and eS325 used in other recent Samsung devices. For power management, the S5 employs the Qualcomm PMC8974 chip, which integrates within a single chip the functionality previously distributed over two or more power management ICs. IHS could not confirm the supplier of the MIMO Wi-Fi module used in the Galaxy S5, but the device features the first sighting of 802.11ac Wi-Fi with multiple-input, multiple-output (MIMO) technology. The module supports both the Wi-Fi and Bluetooth functionality. 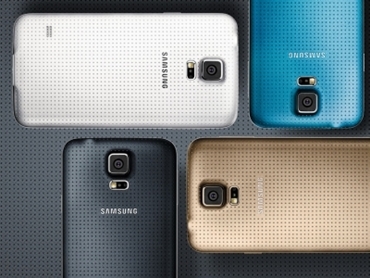 The core of the Samsung Galaxy S5 is the Qualcomm MSM8974AC. The processor is a variant of the MSM8974, which is used in a number of mobile products ranging from the Nokia Lumia 1520, to the Galaxy Round, to the LG Google Nexus 5. The AC variant uses the newer Snapdragon 801 processor, as opposed to the 800 used in the MSM8974. This gives it a faster clock speed, at 2.5GHz, compared to 2.3GHz in the MSM8974 with the Snapdragon 800. Additionally, the MSM8974AC processor combines the functionality of two formerly separate chips, the core applications processor and the wireless semiconductor, helping Samsung engineers save internal board space and reduce the manufacturing cost by eliminating the use of separate ICs. Of course, this comes at a greater component cost for the processor itself, which is estimated at US$41. The S5 integrates the typical accelerometer, gyroscope and magnetometer sensors, but adds a barometric pressure sensor and fingerprint and pulse sensor. The addition of fingerprinting is seen as following the lead of the Apple iPhone 5S. The Maxim MAX86900, meanwhile, detects pulse, and indicates an interest by Samsung towards catering for the demand from consumers for activity monitors and wearable devices which cater to personal health, lifestyle and sporting statistics tracking.